SpaceX will make its tenth launch of the year Tuesday, deploying five commercial Iridium communications satellites and the GRACE Follow-On Earth science mission for NASA and the German Research Centre for Geosciences. The flight-proven Falcon 9 rocket will lift off from California’s Vandenberg Air Force Base at 12:47:48 local time (19:47 UTC). 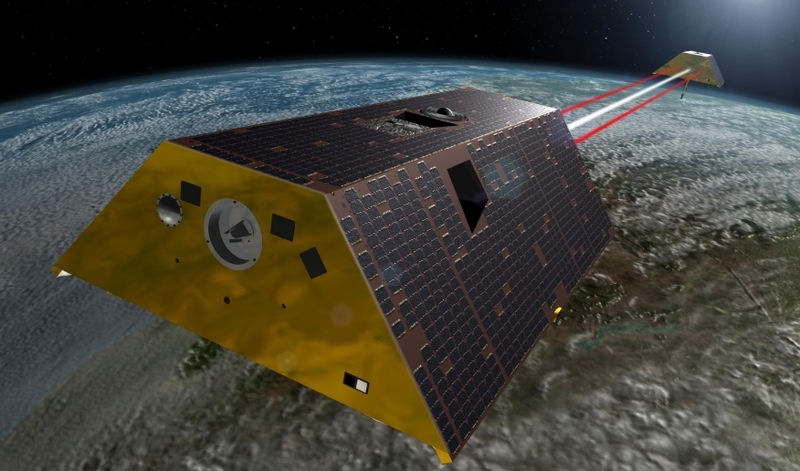 The dual-satellite GRACE Follow-On mission, a partnership between NASA and the German Research Centre for Geosciences (GFZ), is a successor to the highly-successful GRACE satellites that ceased operations last year after fifteen years of service. Tuesday’s launch will also carry to orbit five more satellites for Iridium Communications’ second-generation Iridium-NEXT constellation, joining fifty such spacecraft already in operation. It is the sixth launch that SpaceX has conducted for Iridium since the start of 2017. Tuesday’s launch came about as a result of Russia’s Dnepr rocket becoming unavailable, in part due to the ongoing political situation in Ukraine. Grace Follow-On had been booked to fly aboard Dnepr, while Iridium had contracted for launches of the Russian vehicle to carry pairs of its spacecraft into orbit for testing, and later replenishment of its constellation. 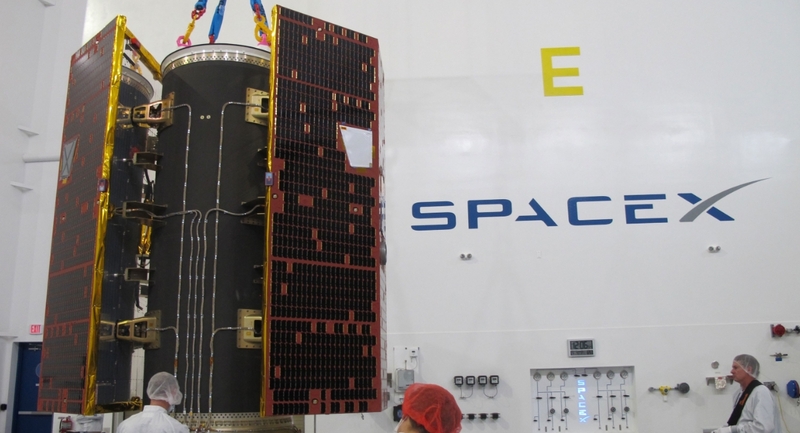 Early last year, Iridium and the GFZ – who are responsible for arranging GRACE’s ride to orbit – agreed to share a launch on SpaceX’s more powerful Falcon 9 rocket, splitting the costs while allowing the GRACE mission to continue and Iridium to get further satellites into orbit. Dnepr, a conversion of the Soviet-era R-36MUTTKh missile, was a joint venture between Russia and Ukraine to leverage leftover hardware from decommissioned intercontinental ballistic missiles to place commercial payloads into orbit. Russia’s ISC Kosmotras marketed the rocket, which made twenty-two flights between 1999 and 2015. Before the end of the program, several launches had been delayed by political disagreements over the drop zones for the rocket’s spent stages and the Russian government had made several unrelated threats to cancel the program. Following Russia’s 2014 military intervention in Crimea the partnership became untenable and launches have since stopped. The Iridium and GRACE joint launch is not the only mission that SpaceX has gained because of Dnepr’s demise. In February Falcon 9 deployed Spain’s Paz radar imaging satellite, which had also been booked onto Dnepr until 2016. The Gravity Recovery and Climate Experiment Follow-On (GRACE Follow-On or just GRACE-FO) consists of two identical satellites that will fly in relatively close formation. The mission will study fluctuations in Earth’s gravitational field, building a highly accurate model of Earth’s gravity to help studies of the planet’s climate. Orbiting 220 kilometers (137 miles) apart, the spacecraft will monitor minute fluctuations in their separation distance that result from gravity perturbing their orbits. Airbus Defence and Space constructed the GRACE-FO satellites, based around the same Flexbus platform that was used for the original GRACE satellites that they will replace. Each satellite has a mass – including propellant – of 600.2 kilograms (1,323.2 lb). Each satellite has a trapezoidal prism shape – measuring 0.69 meters (2.3 feet) across at the narrowest point and 1.9 meters (6.4 feet) across at the widest – with a length of 3.1 meters (10.2 feet) and height of 0.78 meters (2.6 feet). Three sides of each satellite are covered in gallium arsenide solar cells, generating power for the mission and charging a 78 amp-hour lithium-ion battery. The GRACE-FO mission is expected to last at least five years – but requires both satellites in healthy condition to collect useful data. Each satellite is equipped with a Microwave Ranging Instrument (MWI) – also known as K-Band Ranging (KBR) – which uses dual one-way ranging to determine the distance between the two satellites. MWI broadcasts a 24 gigahertz K-band and a 32 gigahertz Ka-band signal that are received by the other satellite. Both spacecraft comparing the phase of the signals they receive to the signals they broadcast to determine changes in their relative positioning to within a few microns. GRACE-FO also carries a Laser Ranging Inferometer (LRI), an experimental instrument that will use lasers to measure the distance between the two satellites. The data collected can be compared with that obtained by MWI to validate the use of lasers, which could become the primary instrument on any mission to succeed GRACE-FO. Scientists hope that the two instruments will be able to operate in tandem on GRACE-FO, providing more accurate and reliable data. Accelerometers aboard both satellites will help to identify any other forces acting on the satellites that could affect their positioning, while laser retroreflectors and GPS receivers will be used to build an accurate model of their orbits. The GPS receivers will also allow GRACE-FO to engage in a technique called limb-sounding or GPS occultation, using the delay or refraction of signals passing through Earth’s atmosphere to infer atmospheric conditions such as temperature, pressure and humidity. GRACE-FO will map the Earth’s gravitational field every month, building a model of changes in the distribution of the planet’s mass that cause the gravitational fluctuations. This is vital to building an understanding of Earth’s water cycle as much of the change in Earth’s mass distribution – and hence gravity – is due to water flowing around the planet or evaporating into the atmosphere. By seeing how gravity changes, GRACE can help to track these processes. The satellites will also help to detect changes in the Earth’s internal structure – such as where material is shifted by an earthquake – and mass change events that can affect the planet’s rotation. GRACE-FO will continue the research conducted by the original GRACE mission. GRACE launched on the first operational flight of Russia’s Rokot rocket, with a Briz-KM upper stage, in March 2002. Designed to operate for five years, the twin satellites continued to provide valuable scientific data until last September, when GRACE-2’s batteries degraded to the point they could no longer reliably power the spacecraft and both satellites were deorbited. GRACE-2 reentered on 24 December, while GRACE-1 finally decayed on 10 March this year – a week short of its sixteenth anniversary on orbit. GRACE also formed the inspiration for NASA’s GRAIL mission, which performed similar research to study the magnetic field of the Moon. GRAIL launched aboard a Delta II rocket in September 2011 and used the same techniques as GRACE in Lunar orbit to map the Moon’s gravitational field, revealing details about its interior structure. The two spacecraft – named Ebb and Flow – were deorbited at the end of their mission, impacting the Lunar surface in December 2012. The five Iridium-NEXT satellites aboard Tuesday’s launch will bring the total number of second-generation spacecraft in Iridium Communications’ constellation up to fifty-five. Iridium is a leading mobile satellite communications provider, utilizing a large fleet of satellites in low Earth orbit to offer mobile telephone and broadband internet services worldwide. Iridium requires a fleet of sixty-six satellites – not including on-orbit spares – to offer continuous service. Early designs for the system required seventy-seven, with the spacecraft being named after the chemical element iridium, which has atomic number 77. The Iridium constellation has six orbital planes, with eleven satellites per plane. These spacecraft are positioned in circular near-polar orbits, at an altitude of 780 kilometers (485 miles, 421 nautical miles) and an inclination of 86.4 degrees to the equator. The first-generation Iridium constellation was deployed between 1997 and 2002 by Iridium SSC, bankrolled by Motorola. A global fleet of rockets – including the US Delta II, Russia’s Proton-K and Rokot and China’s Chang Zheng 2C – was employed to get the satellites in space as quickly as possible, because the constellation had very high set-up costs and could not begin generating revenue until the minimum 66 satellites were in service. It was a combination of these setup costs – estimated at around five billion US dollars – and slower-than-expected customer uptake that led to Iridium SSC filing for bankruptcy in 1999. In 2001, a new company bought Iridium SSC’s assets at a fraction of their original value – this would become today’s Iridium Communications. First-generation Iridium satellites were designed to operate for eight years. However, with no replenishment launches between 2002 and 2017 the entire constellation was pressed far beyond its design life. In 2010 Iridium signed a contract with Thales Alenia Space for eighty-one new satellites to replace its entire fleet. Thales Alenia Space serves as the prime contractor for the Iridium-NEXT project, with Orbital ATK subcontracted to carry out final assembly in the United States. Iridium-NEXT satellites are built around Thales Alenia Space’s ELiTeBus-1000 platform, an extended-lifetime version of the company’s earlier Proteus line. Each satellite has a mass of 860 kilograms (1,900 lb), with a minimum expected lifespan of ten years – although Iridium hopes they will last at least fifteen. The spacecraft are equipped with L-band and Ka-band transponders: L-band provides connections to consumer devices, while the Ka-band transponders are used for crosslinks between adjacent satellites and to downlink data to ground stations. Each satellite can crosslink with the spacecraft directly ahead of and behind it in the same plane, and with the two satellites orbiting parallel to it in the planes to either side. By utilizing crosslinks, Iridium can route calls around the network directly, without needing to bounce them through ground stations. This reduces the cost of the system – as fewer ground stations are required – and improves latency for the end user. The first ten Iridium-NEXT satellites were launched by SpaceX last January, with subsequent flights bringing the total on orbit before Tuesday’s launch up to 50. With the new spacecraft entering service, Iridium has begun decommissioning their older spacecraft, which are placed into lower orbits to hasten their reentry. The Iridium constellation is known to casual skywatchers for its “Iridium flares”, visual phenomena where light from the Sun is reflected by antennae on the satellites, briefly making them some of the brightest objects in the night sky. While any satellite with a reflective surface – such as an antenna or a solar panel – can produce a flare, Iridium’s first-generation spacecraft flared regularly and predictably to the point that flares could be forecast to the second. Iridium-NEXT satellites do not flare in the same way, so as older satellites are deorbited the flares will gradually stop. SpaceX’s Falcon 9 rocket will provide GRACE-FO and the five Iridium satellites with their ride into orbit. First flown in June 2010, Falcon 9 is a two-stage liquid-fuelled rocket that features a reusable first stage and is making its fifty-fifth flight with this mission. Tuesday’s launch will use a “flight proven” rocket – one where the first stage has already been flown once. In this case, the first stage is Core 1043, which first flew in January’s flight with the Zuma satellite for Northrop Grumman, on behalf of an undisclosed US Government customer. The Zuma launch took place from Florida’s Cape Canaveral Air Force Station. 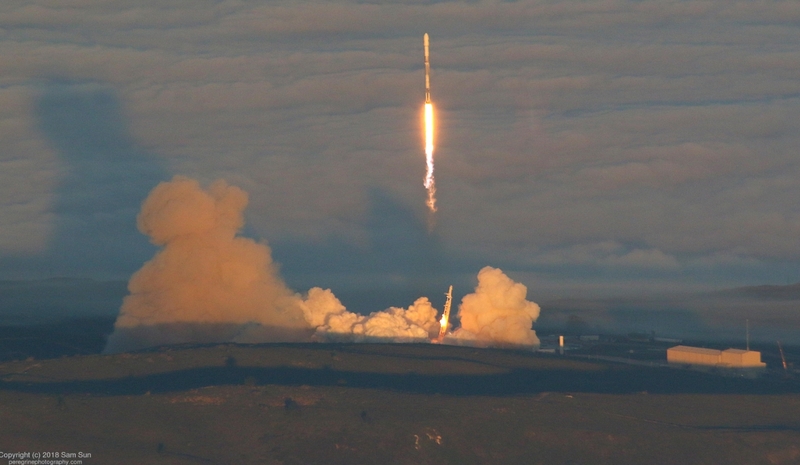 Zuma was the first orbital launch of 2018 worldwide. Falcon 9 performed successfully, but Zuma failed to separate – the fault of a custom separation mechanism was provided by Northrop Grumman that was used instead of Falcon’s own system. Falcon 9’s second stage was deorbited as planned, with the payload burning up on reentry. The first stage, meanwhile, made a successful landing at Cape Canaveral’s Landing Zone 1 – built on the site of the former Launch Complex 13. Core 1043 is the twelfth Falcon 9 first stage – also known as a “core” or “booster” – to make a second flight. This number includes two cores that were converted to serve as side boosters on the Falcon Heavy test flight in February. It is a Block 4 first stage, part of the previous generation that has been superseded by the new Block 5 version of the stage that made its debut earlier this month. While Block 5 cores are designed to be reused many times, the earlier models can only fly twice. Since Tuesday’s launch would be Core 1043’s final flight in any case, SpaceX will not attempt to recover the booster at the end of its mission. SpaceX sees reusability as a way to reduce the cost of access to space, by allowing the same hardware to support multiple missions. The company has already achieved considerable success in recovering and reusing the first stage, and founder and CEO Elon Musk is confident that the whole Falcon 9 vehicle can be made reusable, including the second stage. SpaceX is yet to attempt a second stage recovery, but it has begun to attempt recovery operations for the rocket’s payload fairing. The fairing – which costs around six million dollars – forms the nose of the rocket, enclosing the payload and protecting it from the atmosphere during ascent. Once in space, the fairing is no longer needed and is jettisoned to save weight. SpaceX intends to bring the fairing back to Earth so it can be re-flown on later missions. At the current stage of testing, SpaceX is only attempting to recover one of the fairing’s two halves. After separating from the rocket, the half of the fairing that is to be recovered will orient itself to reenter the atmosphere. As it descends, a parachute will deploy and a ship, named Mr Steven, will attempt to maneuver into place underneath the fairing to catch it. Mr Steven is outfitted with a net, suspended between four posts, to arrest the descent of the fairing. The ship is used to retrieve the fairing before it hits the sea, preventing it from being contaminated by the salt water. 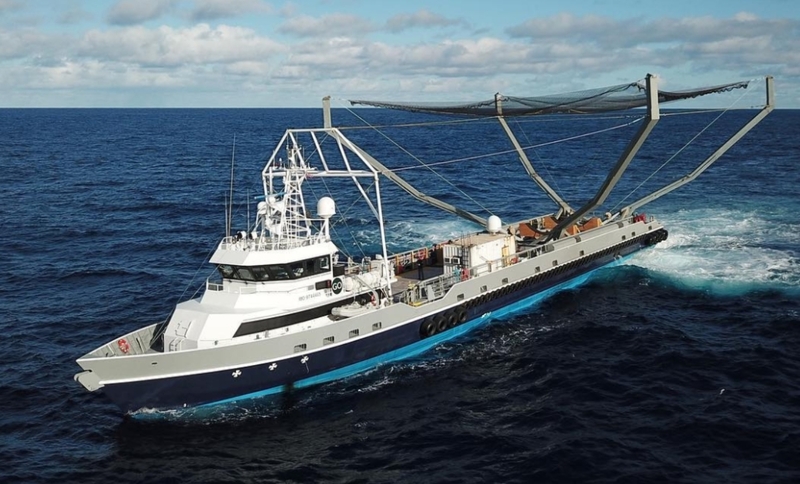 Mr. Steven, via SpaceX, but now has a new net. On recent West Coast launches, SpaceX has landed the fairing intact in the sea. However, it has not yet been able to catch it with the boat. Another attempt is expected to be made during Tuesday’s launch. 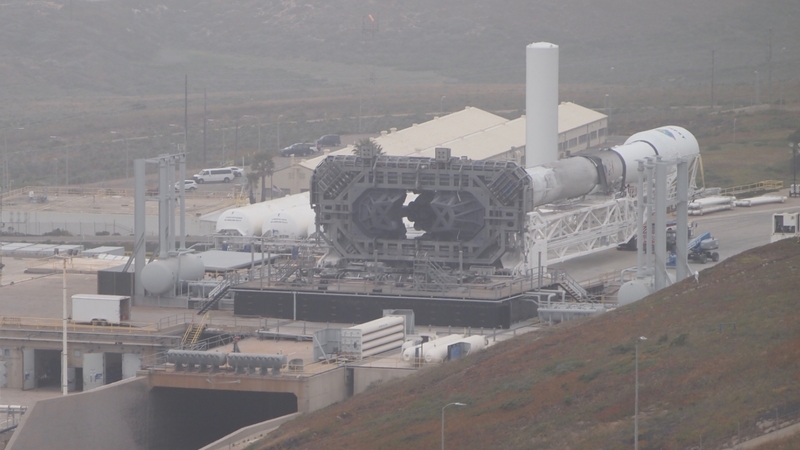 Falcon 9 will lift off from Space Launch Complex 4E – a former Titan IV launch pad – at California’s Vandenberg Air Force Base. 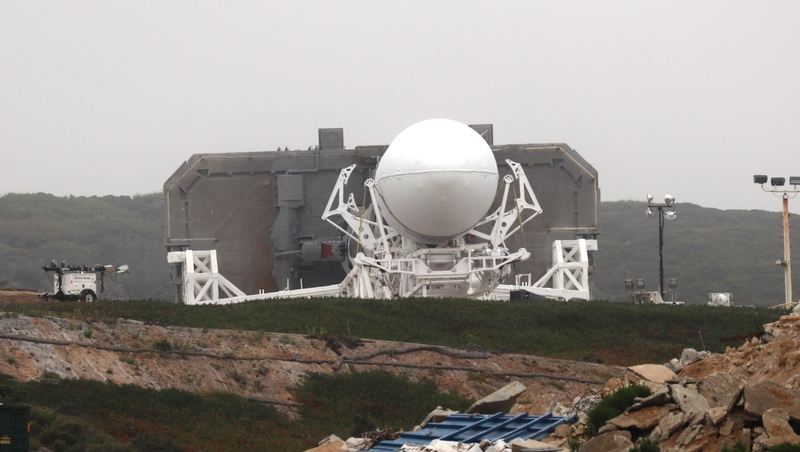 SLC-4E was originally built as Launch Complex 2-4 at the US Navy’s Point Arguello launch site, which merged with the adjacent Vandenberg Air Force Base in 1964. The pad supported its first launch – an Atlas-Agena – a few weeks after the merger, with Atlas launches continuing until 1967. Between 1971 and 2005 Titan III and later Titan IV rockets flew from SLC-4E, with the final flight in October 2005 marking the retirement of the Titan family of rockets. 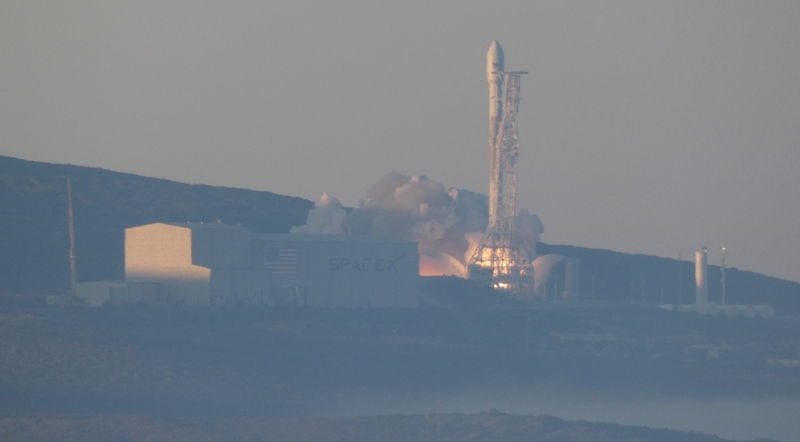 SpaceX made its first flight from Vandenberg from Complex 4E in September 2013. Tuesday’s launch will begin with ignition of Falcon 9’s nine Merlin-1D first stage engines three seconds before the countdown reaches zero. Provided no problems are detected, Falcon will lift off at T-0, beginning its climb towards orbit. Seventy-nine seconds into flight the rocket will pass through Max-Q, the area of maximum dynamic pressure. Core 1043 will power the Falcon 9 for the first two minutes and 46 seconds of flight before reaching main engine cutoff (MECO). Three seconds later the first and second stages will separate. While SpaceX does not intend to recover the first stage, it will likely still perform its descent sequence – including entry and landing burns – to gather additional data before the stage splashes-down in the Pacific Ocean. Eight seconds after stage separation, the second stage’s engine will ignite. The second stage is powered by a single Merlin Vacuum (MVac) engine. The MVac is a Merlin-1D that has been optimized to deliver peak performance in the vacuum of space. The second stage will fire twice during Tuesday’s mission – first to reach an initial deployment orbit for GRACE-FO, and then again before the Iridium satellites are deployed. Falcon’s payload fairing will separate fifteen seconds into the first burn, with the two halves of the fairing falling away from the rocket. The first burn will last seven minutes and sixteen seconds, establishing a circular orbit 490 kilometers (305 miles, 265 nautical miles) above the Earth’s surface at an inclination of 89 degrees. After the burn completes, the second stage will reorient itself for spacecraft separation, pitching down thirty degrees and rolling so that one satellite will separate in the direction of Earth and the other will separate away from it. GRACE-FO will separate eighty seconds after the end of the burn – with less than 20 milliseconds between the two satellites’ deployments. The first signals from the satellites will be received as they pass over McMurdo Station in Antarctica, about 23 minutes separation from the rocket. Forty-five minutes and 22 seconds after GRACE-FO separates, the second stage will restart for its second burn. Lasting just eight seconds, this maneuver will place the Iridium payloads into their planned deployment orbit. The first of the five satellites will separate eight-and-three-quarter minutes after the burn concludes, with further separation events over the next six minutes and 40 seconds. SpaceX is hoping to follow up Tuesday’s launch – their tenth of the year so far – with another mission next week. Currently slated for the early hours of next Thursday morning, that flight takes place from Cape Canaveral, with another flight-proven Falcon 9 deploying the SES-12 communications satellite. 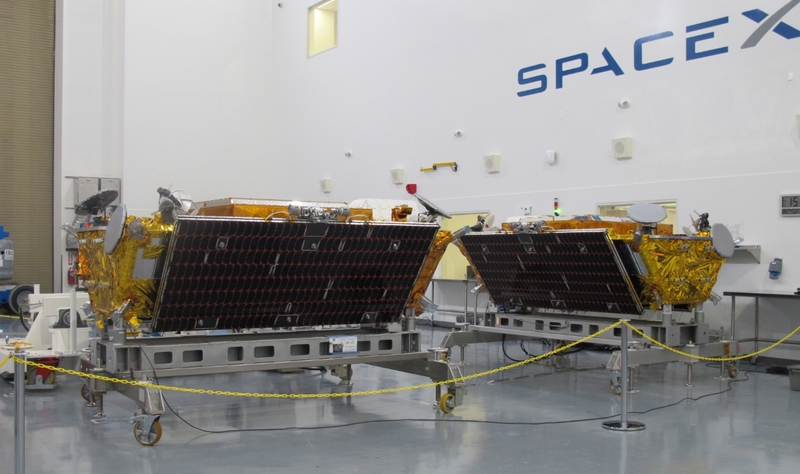 SpaceX’s next mission for Iridium will occur in early July with another tranche of ten satellites – while the company’s next mission for NASA will be the CRS-15 Dragon resupply flight to the International Space Station – currently slated for late June.